There is a tech side to just about every industry, including fashion. It goes beyond purchasing a new favorite sweater on Amazon. Today, you can scroll through Instagram, click on a photo, zoom in to see a product, and buy it with one click. AI technology is even finding its way into traditional store shopping. You can go to a store and take a picture of a shirt, pants, or a jacket—and using one of several apps, such as Kim Kardashian’s Screenshop app, you can upload the picture and find similar styles and products all over the world. There are even avatar-based apps, such as Dressing Room, that allow individuals to try on clothing virtually. When ready, you can pay for the item with Apple Pay, which is located in your smartphone’s digital wallet. Like any industry, the bottom line drives fashion-related businesses, and technological advances are constantly challenging that bottom line. However, the data points collected from searches and purchases are narrowing the gap between product supply and demand, meaning product numbers are more accurate, and fewer materials are wasted. Data are also helping companies predict trends and provide products their customers actually like and want. As with most business verticals, the fashion industry maintains wholesale production intermediaries. 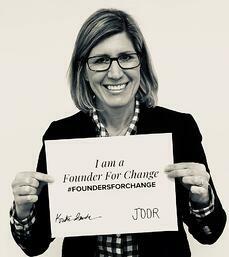 JOOR is one of those companies leading the digital wholesale charge, using analytics within the fashion vertical. Their digital platform connects buyers and sellers online, helping buyers save time and cut costs and leading sellers to better analyze the performance of their inventory. The company’s model embraces the global shift to mobile-first access and capitalizes on the ease and convenience of streaming handheld devices. Digitizing streamlines the fashion buyer’s process, and as is typically the case when digital technology is implemented, this reduces errors and saves time. The success of JOOR was recognized with a Stevie® Award in Best New Software Product or Service Category. JOOR was founded in 2010 and is based in New York City, New York, United States. CEO Kristin Savilia is at the helm. She came on board in March 2017 and brought with her 18 years of retail experience and over five years in e-commerce with XO Group (the parent company of popular websites The Bump, The Nest, and The Knot). Even in the hustle and bustle of a technology-driven fashion industry, Savilia—a proactive mother of four—strives for a positive work-life balance. While she helped lead JOOR to the head of the fashion AI and VR app curve, more technological changes are on the horizon. NextWeb reports the world is ready for the Internet of Things (IoT). In this landscape, individuals will be able to interact with businesses through their yoga pants, informing the companies that made them what they liked best and least. This will allow the companies to make more of those kinds of pants or to offer improved versions, depending on feedback. That is technology and fashion coming full circle. Try clothes on a virtual reality avatar, search AI apps for any and all styles you like, and then communicate with the product and company directly using the IoT. Companies analyze the data, and the technological personalization and product customization cycle evolves. In the long run, this seems cost effective and efficient while reducing waste—but it remains to be seen if consumers want to wear yoga pants and other products with AI sensors. Many consumers, however, already talk to Siri (Apple) and Alexa (Amazon), so it might not be too long before this is the product norm. As recently as 2014, just about everyone (other than Julianne Ponan) doubted her fledgling health food brand would survive—let alone find widespread distribution throughout Europe. 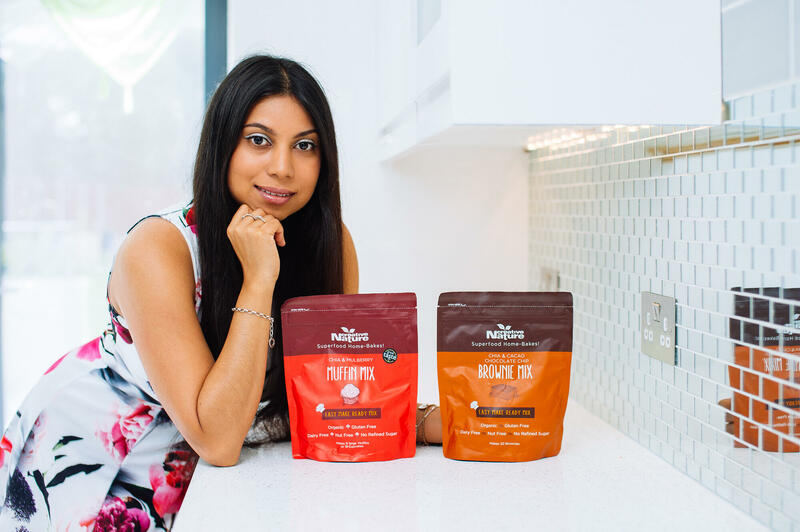 As the owner of Creative Nature, a UK-based company specializing in allergy-friendly vegan snacks and baking mixes, Ponan staked her fortunes on a crowdsourcing effort aimed at raising £150,000 of capital. However, the attempt to capture investors fell well short of the mark. The failed fundraising campaign was the latest in a series of setbacks for the company, which was losing money at a fast clip. Three years earlier, a 22-year-old Ponan, then working as a financial analyst, was brought in to diagnose why Creative Nature was operating in the red. At the time, the company marketed a wide range of products, from home goods to natural food products. The latter gave Ponan hope. After all, she knew firsthand the importance of a carefully selected diet. The entrepreneur suffers from multiple food allergies to this day and survived two acute cases of pancreatitis as a young girl. Ponan says doctors gave her four hours to live after diagnosing the first case of pancreatitis when she was nine. She lived, but it resurfaced at 17, when physicians gave her just a few short years to live. She ended up executing a management buyout of the London, England–area business in 2012, with the goal of growing the superfood segment. It wasn’t just her personal experience she banked on, though. She also saw the continent’s rising obesity levels and the increased prevalence of food allergies as proof this niche market was poised for growth. The number of Europeans who suffer from chronic allergies tops 150 million, according to the European Academy of Allergy and Clinical Immunology. The group estimates half of the entire EU populace will be impacted by 2025. “I took over Creative Nature to cater to people like me—people who want healthier snacks without the nasty additives,” she says. With her business partner, Matthew Ford, the company started focusing on snack bars and baking mixes that were free from 14 of the most common food allergens. “Most ‘healthy’ snack companies insist on filling their products with tree nuts, peanuts, and seeds, which completely ignores a whole consumer base of allergy sufferers,” Ponan says. When the crowdsourcing plan turned south and it looked as if the whole enterprise might be a flop, the breakthrough finally came. Creative Nature captured the interest of a buyer at Tesco, a major UK supermarket chain. Virtually overnight, it seemed as if the company’s fortunes were turning around. Still, one major hurdle remained. As it turned out, the two-person team made the launch and used the deal as a platform to propel themselves into more supermarkets. Today, the company, which now has six full-time employees, is stocked in more than 15 countries, including Switzerland and Denmark. Because of the organization’s compelling turnaround, Ponan earned the Silver Stevie® Award for Young Female Entrepreneur of the Year. The Stevie Awards have a made a significant multi-year financial contribution to the Center for Innovation and Entrepreneurship in the School of Business at George Mason University, the largest public university in the State of Virginia in the USA. Michael Gallagher, Stevie Awards president and a 1994 MBA graduate of the university, has been actively involved with Mason for more than 20 years. So much so that he was honored with the university’s 2015 Alumni Service Award. In 2005, he worked closely with the School of Business Alumni Relations staff to create the first Annual Business Alumni Celebration, the School of Business' premiere alumni event. In 2009, he became active with the School of Business Alumni Chapter, serving as vice president of events and then led the group as president for the next two years. After completing his tenure as president, he served as an at-large member for another year and most recently led the chapter's fundraising committee. Gallagher regularly contributes time and money to the School of Business’ annual Deans’ Business Plan Competition and often serves as a mentor to student entrepreneurs. Still, he wanted to do more. “I feel strongly about encouraging people to become entrepreneurs,” said Gallagher. Having already volunteered much of his time and financially supported several of the entrepreneurial activities the School of Business offered, Gallagher saw a natural alignment with his interests and the school’s Center for Innovation and Entrepreneurship. He learned through a conversation with David Miller, director of Mason’s Center for Innovation and Entrepreneurship, that the center didn’t lack for ideas and projects, it lacked time to properly run and grow the initiatives already created. Gallagher immediately pledged that the Stevie Awards would contribute $195,000 to give the center the gift of time, which comes in the form of a program manager that will help run the center’s programs. With current opportunities for students ranging from field trips, mentor programs, a maker space, business plan competition, an innovation lab, student support groups, and more, Miller found it challenging to provide each initiative the attention it needed to fully serve students. The new program manager funded by the Stevie Awards will be fully dedicated to expanding and resourcing existing opportunities. This will provide Miller more time to nurture student entrepreneurs and hopefully, increase their success. 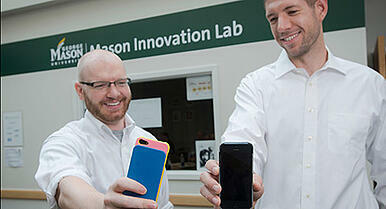 Learn more about Mason’s Center for Innovation and Entrepreneurship or contribute to its success by making a gift. The Stevie® Awards, organizer of the world’s premier business awards programs, has issued the call for entries for its 2016 (13th annual) Stevie Awards for Women in Business. Entry kits and complete details on the competition are available at www.StevieAwards.com/Women. The awards are produced by the creators of the prestigious American Business Awards and International Business Awards. The Stevie Awards for Women in Business honor the achievements of working women in more than 85 categories including, among others, Best Entrepreneur, Best Executive, Mentor or Coach of the Year, Lifetime Achievement Award, Women Helping Women, Employee of the Year, Woman-Owned or -Run Company of the Year and Innovator of the Year. All female entrepreneurs, executives, employees and the organizations they run, anywhere in the world, are eligible to be nominated. The early-bird entry deadline is July 20 and includes reduced entry fees. The final entry deadline is August 24, but late entries will be accepted through September 21 with payment of a late fee. Finalists will be announced on October 5. The Gold, Silver and Bronze Stevie Award winners will be revealed at a gala awards dinner at the Marriott Marquis Hotel in New York City on November 18, 2016. Most categories require the payment of an entry fee for the submission of a nomination. Several categories, such as most honoring women in the non-profit and governmental sectors, and the Startup of the Year categories, do not have a fee. Susan LaPlante-Dube and Maureen Condon, principals at Precision Marketing Group and 2015 Gold Stevie Award winners, commented on the impact of their win. “Being recognized as one of the first-ever Women-Run Workplace of the Year winners was truly an honor. We’ve worked hard to balance our commitment to being responsive to our clients with our vision of maintaining a flexible, supportive work environment for our team. It’s important to us that our employees are engaged and challenged every day—and winning this Gold Stevie Award was a great testament to the team and the way the company culture allows employees to have rich, fulfilling personal lives." The 2015 Gold, Silver and Bronze Stevie Award winners reflected a diverse group of large and small organizations around the globe. The 2016 Stevie Awards for Women in Business will be judged by more than 200 leading professionals around the world, and nominees will have access to the judges’ comments and suggestions about their nominations. We are pleased to share that video clips from the 2012 (9th annual) Stevie® Awards for Women in Business awards dinner are now available to view on YouTube. 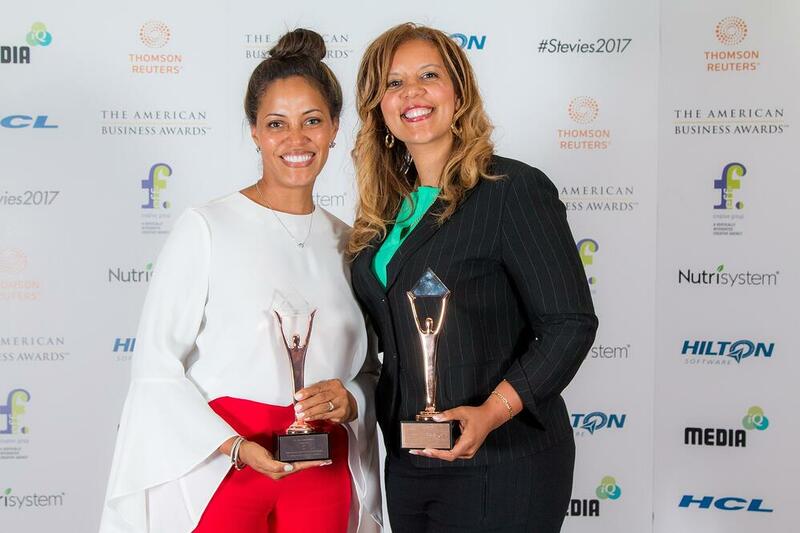 Recognized as the world's premier business awards for women executives, entrepreneurs, and the organizations they run, the Stevie Awards for Women in Business were celebrated on November 9 at the Marriott Marquis Hotel in New York City. 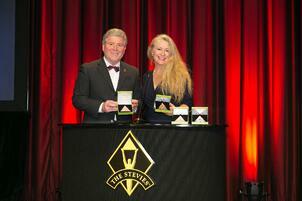 Watch the 2012 Stevie Awards for Women in Business awards presentations here. Founder and CEO, Jessica Eaves Mathews, gracefully accepts the award and starts the evening off by reminding the audience about the powerful impact of women owned businesses. All the way from Shifnal, Shropshire, United Kingdom, Deborah thanks the Stevie Awards and her American suppliers for contributing to her success. MAC Presents of New York, NY, USA, humbly accepts the Gold Stevie Award and expresses gratitude for their strong partnerships. Christiane thanks her company and family for supporting her throughout her business endeavors. Giving the final speech of the night, Kim thanks her company, her team, and her family for all of their support. Want more resources from the Stevie Awards for Women in Business celebration? Watch all acceptance speeches, listen to the live recording, view photos from the event, and download the awards dinner program book. New York, NY – November 12, 2012 – Shining a spotlight on women executives, entrepreneurs, and organizations run by women, the Stevie Awards for Women in Business announced the results of its 2012 competition on Friday, November 9. 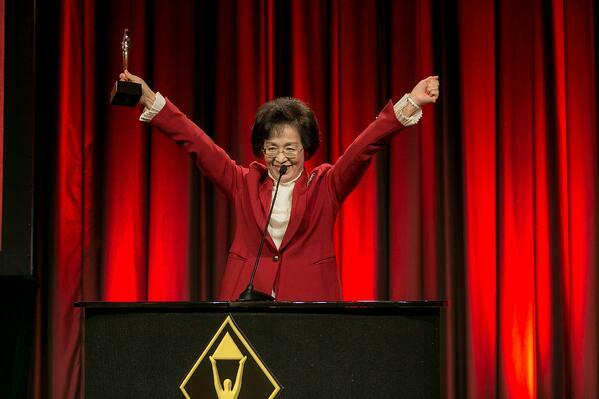 With more than 340 businesswomen and their guests in attendance, the awards were announced at a gala dinner at the Marriott Marquis Hotel in New York City. Nations represented at the event include Australia, Canada, Ecuador, Germany, Hungary, India, Israel, Japan, New Zealand, Nigeria, Turkey, the United Kingdom, and the U.S.A. The presentations were broadcast live across the U.S.A. by the Business TalkRadio Network. More than 1,200 nominations from organizations and individuals in 17 nations were submitted to the awards this year for consideration in categories including Entrepreneur of the Year, Executive of the Year, Most Innovative Company of the Year, and Best New Company of the Year, among others. More than 250 professionals around the world participated in the judging process to determine the Finalists and then the Gold, Silver and Bronze Stevie Award placements. The 2012 Gold, Silver and Bronze Stevie Award winners reflect a diverse group of large and small organizations from around the globe. Organizations that won more than one Gold Stevie Award include Accenture, Creative Catapult, LLC, eCycle LLC, Friends of the Global Fund Africa, Oncology Rehab Partners, Sentis Pty Ltd, Susan Davis International, and Vaco Los Angeles. For a complete list of Stevie Award winners and more information, visit www.StevieAwards.com/Women. Entries for the 2013 edition of the awards will open next May.